With the dramatic drop in installation costs and expansion of financing options, solar power is a smart choice for homeowners. Did you know that the price of solar energy is at an all-time low? According to a recent report conducted by the Lawrence Berkeley National Laboratory (Berkeley Lab), due to lower solar installation costs, improved project efficiency, and a 70 percent decline in purchase agreement prices since 2009, this renewable energy resource has never been more affordable! 2. New solar projects also generate electricity more efficiently, which makes them a better investment. PV projects performed at a a notable improvement in 2014 according to the report findings. The improvement is due to better resource areas, and better solar collector fields and tracking technology, which has helped to increase energy capture. 3. Last but not least, the drop in solar power purchase agreements (PPA) has also made solar systems more affordable. A PPA is a financial agreement where a solar contractor constructs the design, permitting, financing and installation of a solar energy system on a customer’s property for very little cost. The developer then sells the power generated to the host customer at a fixed rate that is typically lower than the local utility’s retail rate. 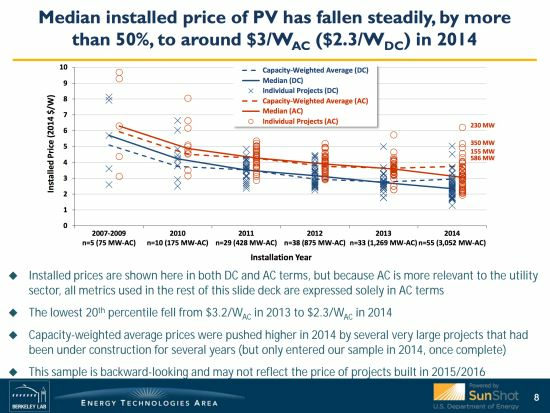 PPA prices have seen a downward price trend since 2006 according to the Berkley Lab report, making solar a much more cost-competitive option for utilities. And since a solar system has been shown to increase residential property values, and long term PPAs can be transferred with the property, homeowners have even more reason to invest in this home improvement strategy with minimal upfront costs. Get free quotes on a solar system installation for your home by filling out the short form below. Solar energy is a major resource in the efforts to reduce carbon emissions and our dependence on fossil fuels, which is thankfully becoming more mainstream every year. With the increased demand for solar systems, consumers have more choices when it comes to choosing a solar power provider at much cheaper prices. If you’re interested in sustainable energy sources such as solar, you can use our solar savings calculator to estimate how much you would save each year with solar energy.